Occasionally I put a new shirt design up on CafePress. In this case I was trying for something that was about violins, but didn’t necesarily say that the wearer plays the instrument. In my new job as a repairer of violins and cellos I obviously know how to bow and pluck the strings so that I can test the instrument, but as of now I cannot be said that I actually have the ability to play the instrument. If you like this shirt design and would like one, they are available via CafePress here: [link] There are styles available for men and women, plus mugs! Sticker with my Ligneroj logo on it! I’ve made a few message shirts in Esperanto about woodworking. If you’d like to buy one, just click the picture of the design you like. The click will take you to CafePress. Many shirt styles to choose from! Some shirt designs are available on a work apron for your workshop! Recently the mint was told to cease production of the gold colored dollar coins. Due to the continued printing of the dollar bill, dollar coins have not been circulating. That is to say they have only been circulating in one direction. Dollar coin enthusiasts get rolls of brass bucks from their preferred financial institution and spend them in their daily lives. These coind however are not given out as change, but for the most part end up back at a bank. Then , according to many articles, they are returned to the mint for storage until the end of time. Many banks only ever receive new coins from the mint, such as the recently interrupted presidential series. When asked, my bank did not affirmatively say that I would be able to get rolls of dollar coins from them when they run out of their presidential dollars. Luckily, I believe I have secured a source of rolls of circulated coins from another local bank. These will likely have that nice patina of use instead of being always shiny and new, a plus! But I really prefer the original Sacagawea dollars as they were minted between AD 2000 and AD 2008. They look like money, not a token. In my opinion removing much of the writing from the face of the coins and inscribing it on the edge was a big mistake. Likewise with the presidential coins, where the letters are so small that I cannot read them without a magnifier! 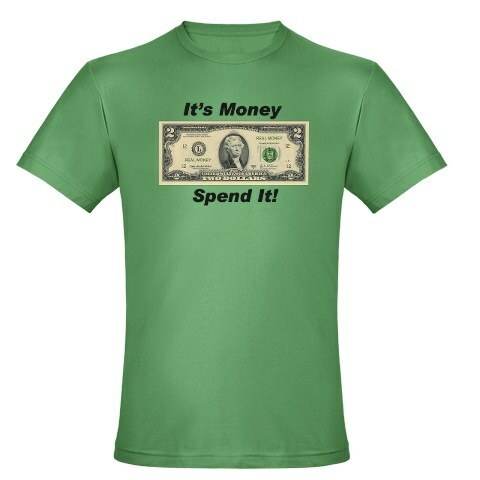 So, for those who enjoy spending dollar coins, and other odd money such as $2 bills and Eisenhower cartwheels, I’ve designed several shirts on CafePress. What’s important though is that you SPEND DOLLAR COINS. Many users of the Dollar Coin use the seldom seen two dollar bill to prevent the necessity of handing over more than a few dollar coins at a time. I myself do not use two dollar bills, or Toms as they are sometimes called because I figure I’m asking for enough Ire using dollar coins. However, since many cashiers apparently do not realize that two dollar bills are still incirculation, I’ve created a shirt just for users of this not-so-rare bank note. I was trying to think of how one could let any prospective cashier know that it’s OK to give dollar coins as change. This could be done by repeatedly saying so at every transaction, but I think it might get tiring and make one sound like a crank. I’ve come up with an alternative. A way that you only have to look like a crank. I’ve put a design up on CafePress for shirts, magnets, and a few other items sporting the reverse of the Presidential dollar (likely the most likely to be seen over the Sacagawea, since the sackie’s reverse now changes every year.) The words ‘I Accept Dollar Coins as Change’ accompany the image. You can buy them from my CafePress shop here. The items will be cheaper buying them from my link above as CafePress charges more if you buy from their ‘Market Place’ I.E. just searching for ‘dollar coin’ for example. Another long term project I’ve had is the designing of Esperanto themed shirts, etc. on CafePress. I’ve always felt it would be cool to see people walking around with Esperanto message shirts. I don’t get rich from this effort, but I do get a trickle of cash once in a while. It’s enough to let me buy one of my own shirts occasionally. I figure the economy might be turning around because this last month I’ve sold at least a shirt a week. Before that there was a great desert of no sales. One other project which I’ll put to the fore after the beginning of 2010 is my translation of a book of daily table prayers. I’ve got it all translated in a notebook. I just need to type it into the computer, do some formatting and put it up for sale. It’s based on a 100 year old book I found on eBay called ‘Grace Before Meals.’ Most f the prayers were easy to translate. A few I rejected or replaced with others. I moved a few around, especially if they seemed more appropriate to Lent. Then I put them in March. I also once translated a short story of mine from English to Esperanto. I posted it on my blog at Esperanto-USA.org. If I were asked, I guess I’d put it up here as well. It’s sort of Star Trekish in it’s premise, and recounts when the Koplushians first found Earth. You are currently browsing the archives for the esprimoj category.